It is not that difficult to make at all if you remember just a couple of simple rules that are outlined for you below. The most important – don’t let the sauce boil as you are thickening it. Put egg yolks in a metal bowl. Sit the bowl over a saucepan filled with cold water. Heat the water, beating the egg yolks constantly with a wire whisk. The water in the pan should not boil and the bowl should stay cool enough to hold with your hand. Continue beating the yolks constantly until they thicken. The yolks have thickened enough when you begin to see the bottom of the bowl between strokes and the mixture forms a light cream on the wires of the whisk. Immediately remove the bowl from over the water. Add the butter, in very small pieces, whisking in each pat and allowing it to melt before adding the next. When you are finished, the mixture should be very smooth and light. Pass the sauce through a fine sieve and stir in the seasonings and lemon juice. If the sauce is too thick, thin it a bit with cold water. Keep in a warm place. DO NOT BOIL, or the sauce will curdle! Plus, don’t let the water in the double boiler come to a full boil. Either will cause the sauce to curdle, the end of your efforts to create a great sauce. If you like this recipe, I’d love you to Pin it to Pinterest, Tweet about it, Like it on Facebook. Please also add your own recipes and a comment below. 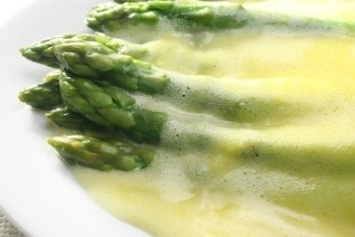 This hollandaise sauce is just one of our amazing savory sauce recipes. Find them all here. I don’t like vinegar so use lemon juice for starters. Have all of the ingredients on the counter, be sure the butter is melted. I use the electric thingy that is like a hand held blender, it sure saves time and energy. Start the recipe with no interruptions, don’t worry, it will work fine, if you curdle it you had the heat boiling in the double boiler, if it is too thick you just need to add a teaspoon or two of water at a time and mix. What gets me is when you as what you can put Hollandase sauce on you always get the same mundane answers, poached eggs, Eggs Benedict, and of course asparagus. Come on be creative, its great on a piece of fish, even if its fried, try it on a bacon sandwich, hot vegetables, so many say put it on brussels sprouts, who the hell eats brussels sprouts anyway, try it on a rib steak, any steak for that matter, it is endless what you can use it with to cover up a dry food, gosh I can’t stand dried food. If you want to be creative, add a dash of tarragon, and don’t be afraid the cayenne makes it have a little zing. Hollandaise over chopped cooked spinach is wonderful with some fresh chopped fried bacon. Use the imagination.